$275 - Baxton Studio BBT8011A2-Black Loveseat Nikko Mid-Century Modern Scandinavian Style Black Faux Leather Wooden 2-Seater Loveseat - 31.59 x 44.66 x 29.45 in. Home Furniture>Living Room>Sofas Baxton Studio BBT8011A2-Black Loveseat Nikko Mid-Century Modern Scandinavian Style Black Faux Leather Wooden 2-Seater Loveseat - 31.59 x 44.66 x 29.45 in. Baxton Studio BBT8011A2-Brown Chair Nikko Mid-Century Modern Scandinavian Style Dark Brown Faux Leather Wooden Lounge Chair - 31.59 x 25.35 x 29.45 in. The Nikko is a stunning lounge chair perfect for modern lounges and receptions. It incorporates the elements of simplicity style and comfort wrapping it all into a new and clean silhouette. Made from solid rubberwood it is purposefully designed for compact everyday use. Upholstered in dark brown faux leather and padded with foam the Nikko is ideal for the conservatory kitchen or your living room. Angular wood frame gives a nod to mid-century style combining Scandinavian design with lux colonial wood in cocoa finishing and complementing the dark espresso-toned upholstery for a moody palette steeped in classic masculinity. Made in Malaysia the Nikko requires assembly. Inspired by mid-century modernist classics the beautifully-grained dining side chair set will be perfect in the dining room kitchen or home office. The Elsa Mid-century Modern Scandinavian Style Dark Walnut Bent Wood Dining Side Chair features solid bentwood seat shapely solid wood legs and a dark walnut finish. 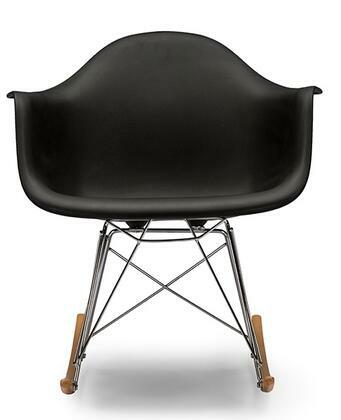 Elegant and comfortable the chair’s delicate form goes hand in hand with its strength and durability. The Carina lounge chair proves that a design can be simple and fun at the same time. 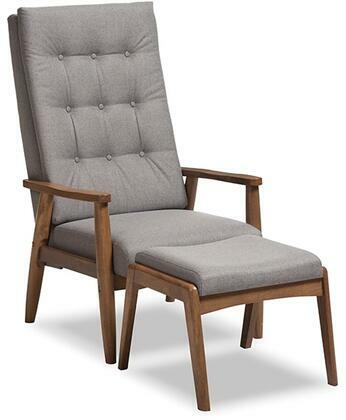 The mid-century modern-inspired design is updated with grey fabric upholstery. The Carina is generously foam-padded for hours of comfort. The chairback features an attractive grid-tufting detail. The casual yet cool low-profile Carina sits on tapered espresso brown legs. This chair will be easy to coordinate with the decor of your livingroom reception area or even as extra seating in your entryway or guest room. Complete the classy cool look with other pieces in the Carina range. Made in China the chair requires assembly. 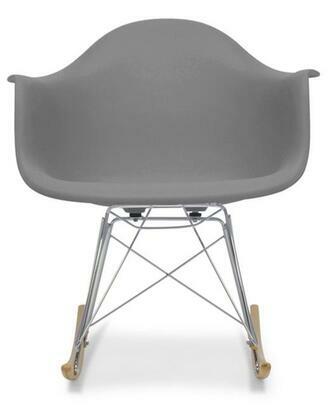 Add stylish and comfortable seating to your space with the Perrine lounge chair. The mid-century modern-inspired design is clear to see in the slight curves of the chair's arms and chair back as well as its low-profile. The Perrine is built to last with a sturdy solid rubberwood frame. The chair is foam-padded and upholstered in a sophisticated greyish beige fabric. The angled tapered legs are finished in a warm walnut brown. The Perrine features a slightly reclined button-tufted chair back with the arm rests placed at a comfortable height. The simplicity of the chair's look makes it easy to coordinate with the existing decor in your livingroom reception area or other shared spaces. Baxton Studio DB-203-Beige Finley Mid-Century Modern Beige Fabric Upholstered Swivel Armchair - 27.3 x 26.91 x 25.74 in. Crafted from the ground up the Finley armchair was intentionally designed to be a piece that reflected classical shapes provideing a comforting feel of the familiar while also challenging design concepts with it's angular armrests edge piping and silver nail heads trim. Featuring swivel base the Finley armchair is constructed of solid wood frame and is upholstered in beige polyester fabric. 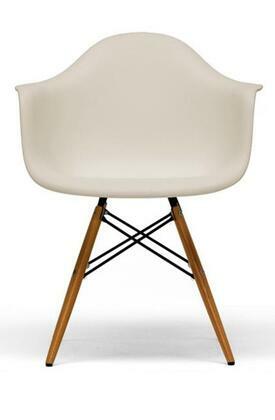 Imbuing a sense of mid-century retro modern design the Finley armchair will work well with your modern home decor. the swivel armchair requires minor assembly. These wooden stools pair clean lines with a sleek finish for a contemporary feel. Seat them at your breakfast table for a Scandinavian look. Rounded edges of the seat soften the silhouette of the stools while the angled legs keep the design fresh and modern. Perfect for quick breakfasts and relaxed dinners you can sit down while you grab a bite. Made in Malaysia the Zula wood stool requires assembly. 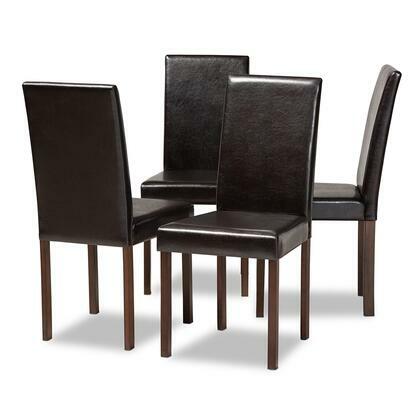 The Wyatt 5-piece Dining Set is a timeless design reminiscent of the traditional English dining room. Crafted from solid rubberwood frame to ensure perfect construction for years to come this dining set comes with grey polyester fabric seat which will lighten up any living space. Long dainty legs combined with a classy spindle back create clean lines and a classic shape that make this dinette at home in almost any decor. Minimalistic and beautiful this dining set can fit comfortably into Scandinavian style homes whilst paying tribute to traditional style. Made in Malaysia the Waytt dining set requires assembly.